When Rosetta met Marie, she was already a gospel recording and performing star. Marie was a young singer just starting out, singing in a quartet and trying not to stand out. But Rosetta saw something in her and asked her to join the band. The play opens with Marie nervously doing Rosetta's make-up in the funeral parlor where they're also going to rehearse for that evening's show. Rosetta slowly draws Marie out of her shell, and it turns out she's not quite as innocent as she seems. Rosetta wants Marie to make the act a little more "church," but also wants to bring out the "swing" in Marie. As they try out songs for their performance, they settle somewhere in the middle of their two styles, and the result is magic. This is a play in which not a lot happens, but much is learned and shared in the exploration of these two lives. Park Square and director Wendy Knox (who also directed the George Brant play Grounded for her theater Frank a few years ago), found the perfect actors to portray these women. 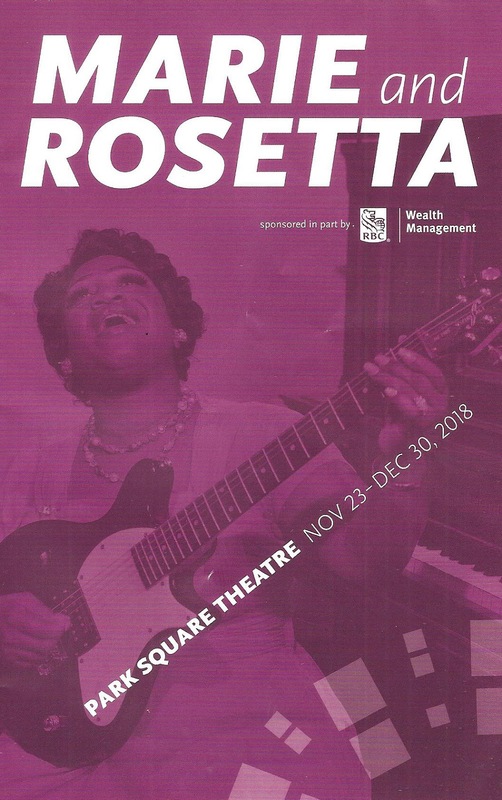 Local music and music-theater favorite Jamecia Bennett (member of the Sounds of Blackness among many other achievements) is a force of nature as Rosetta, big voice and big stage presence. And Rajané Katurah Brown, relative newcomer to the #TCTheater scene, is lovely as Marie, the perfect foil/partner. Both women have amazing voices and performance skills individually (with runs you won't believe), but when they combine, it goes to a whole other place. A thrilling place of musical cohesion and inspiration that caused the opening night crowd to cheer and applaud so loud and long that it almost derailed the play on several occasions. The two women sing about a dozen gospel standards, including "Up Above My Head," written by Rosetta and Marie, while accompanying themselves on piano and guitar (gospel guitar? oh yes!). Except that they're not really playing the instruments (guitarist Michael May and pianist Natalia Peterson supply the sound from behind the set), but they do such a great job faking it that it feels like they are. These four musicians, with music direction by Gary D. Hines and sound design by Peter Morrow, make some really incredible sounds. Did I mention the play is set in a funeral parlor? 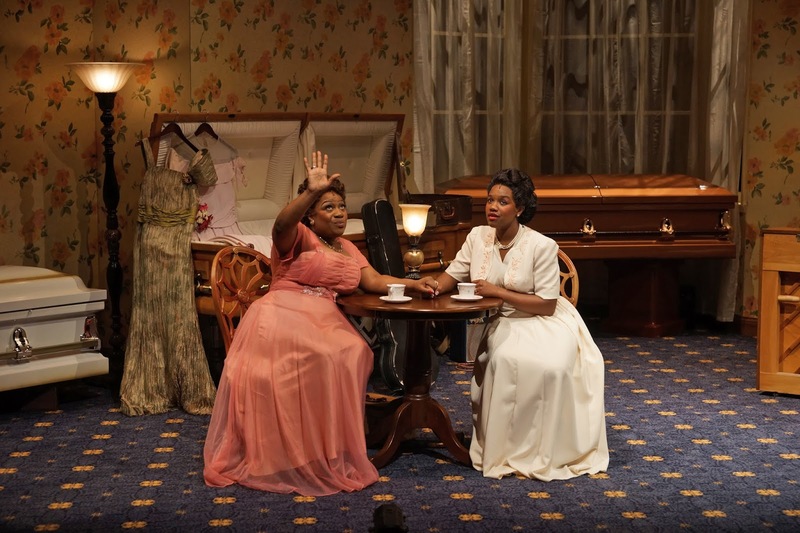 And it looks it thanks to Joseph Stanley's set design, with several caskets, peeling wallpaper on the walls, and funeral parlor furniture (without getting too spoilery, the setting begins to make more sense as the play goes on). And the women look the part of '40s gospel singers, with beautiful gowns and wigs designed by Aaron Chvatal and Robert A. Dunn, respectively. The program notes that the play is 100 minutes* (no intermission) but that was obviously before an audience was brought in. When I saw the show it was closer to two hours, two hours well spent being immersed in the lives of these too music legends. Marie and Rosetta continues at Park Square Theatre in lovely downtown St. Paul through December 30. Watch the below video to get a taste of the magic, then click here for more information and to purchase tickets. *Dear all of the theaters, please do what Park Square does - print the approximate runtime in the program, display it in the theater, and maybe even post it on your website. It's good to set expectations, and sometimes it's necessary to know runtimes for post-show plans. Thanks.